Frank Gold’s family, Hungarian jews, flee the perils of World War II for the safety of Australia, but not long after their arrival, thirteen-year-old Frank is diagnosed with polio. He is sent to a sprawling children’s hospital called The Golden Age, where he meets Elsa, the most beautiful girl he has ever seen, a girl who radiates pure light. Frank and Elsa fall in love, fueling one another’s rehabilitation, facing the perils of illness and adolescence hand in hand, and scandalizing the prudish staff of The Golden Age. Frank and Elsa’s parents, too, must cope with their changing realities. Elsa’s mother Margaret, who has given up everything to be a perfect mother, must reconcile her hopes and dreams with her daughter’s sickness. Frank’s parents, transplants to Australia from a war-torn Europe, are isolated newcomers in a country that they do not love and that does not seem to love them. Frank’s mother Ida, a renowned pianist in Hungary, refuses to allow the western deserts of Australia to become her home. But her husband, Meyer, slowly begins to free himself from the past and integrate into a new society. With tenderness and humor, The Golden Age tells a deeply moving story about illness, resilience and recovery. It is a book about learning to navigate the unfamiliar, about embracing music, poetry, death, and, most importantly, life. Joan London is a bookseller and author living in Perth. She is the author of two short story collections, Sister Ships, which won The Age Book of the Year award, and Letter to Constantine, which won the Steele Rudd Award as well as the West Australian Premier's Award for Fiction, and three novels, Gilgamesh, The Good Parents, and The Golden Age. "Her writing is cleareyed, generous-hearted, never sentimental...every character, however minor, comes to life in these pages. Like her fictional pianist, London is a virtuoso." “Characterization is the novel’s primary achievement. Readers will feel affection for Frank and the many secondary characters." "For all its focus on exile and displacement, 'The Golden Age' is by no means an angry book. It is a quiet, elegiac story of love and renewal and liberation written in crisp prose..."
"The Golden Age serenely affirms the goodness in people and the divinity of the connections between them." "The Golden Age is London's most accomplished and keenly felt work to date...her affection for her characters may be contagious." "Fearless, graceful and deeply benevolent." "A brilliant display of life and change: the transition between war and peace, between love and permission, between terrible paralysis of various kinds and movement." "The Golden Age carries the quiet assurance of a classic, which it will most certainly become. " 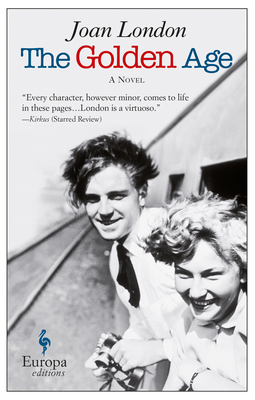 "London’s writing is at its best when bringing to life the coming-of-age story between Frank and Elsa: their hopes and fears (and those of other polio-stricken children), their resolve, and their disappointments. The setting and place are rich and detailed, and Perth feels alive." "[Gilgamesh] captures the romance of wanderlust like no other novel I have read." "[The Good Parents] a dark and lovely work is both a novel of ideas and one of emotions...the mystery of enthrallment only deepens, irradiated by London's gorgeous prose." "London's prose is a seamlessly shifting blend of poetry, pathos, and humor." How do Frank and Elsa’s parents adjust their expectations of their children, as well as their families, after Frank and Elsa are checked into The Golden Age? Does it impact their marriages? Is there a parallel being drawn between the trauma of polio and the trauma of the Holocaust? In your opinion, how does the Gold family’s status as recent émigrés impact their descriptions and attitudes toward Perth? How is Perth compared to Budapest? How representative do you think this is of immigrants’ perception of their new home? How is the Australian landscape used to characterize both the Briggs and the Gold families? How do the physical and psychological effects of polio translate into Elsa and Frank’s adult lives? How does the idea of limited mobility, not only physically from polio but also legally as minors, shape Elsa and Frank’s burgeoning relationship? How do the characters Margaret, Ida, and Olive represent different perspectives on motherhood, widowhood, ambition, and loss? How is the Gold’s struggle to assimilate into Australian life illustrated in Meyer’s gravitation toward Olive? What is the function of art – for the artist and for society – in this novel, especially as manifest in Sullivan, Frank, and Ida? How does the Queen’s visit to Perth, as well as Frank’s resistance toward it, address orunderscore social and political tensions during times of epidemic? In your opinion, is Frank’s desire to complete Seymour’s poem ever achieved, or is itsambiguity the true conclusion?